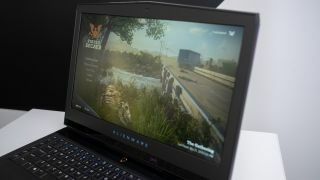 If you want a bargain gaming PC or laptop, then heading over to Dell Outlet can be a good way to get a wallet-friendly machine – particularly as there is an offer currently running which gives you a 20% discount across all gaming models. If you’re not familiar with the site, Dell Outlet sells cheaper than normal machines because they are either refurbished, or refurbished with cosmetic blemishes (or indeed, in some cases, in new and unused condition, if they are unopened returns or cancelled orders). And as mentioned, you can now get 20% off all gaming systems, so whether you’re hunting for a powerful desktop PC, or a groovy gaming laptop – like an Alienware model – you’ll get a fifth off the asking price. You can check out Dell Outlet’s discounts on gaming machines and other coupons right here. All you need to do is enter the code DOGAM20 at checkout, when you’ve got a relevant product in your basket. This promotion begins today, and runs for the rest of the year: so it expires at 23:59 on December 31. Note that Dell offers exactly the same hardware warranty and service on its refurbished PCs, as it gives buyers with new models. So the experience of buying a refurb should be no different to a new piece of hardware (unless you are purchasing a model with cosmetic ‘scratch and dent’ damage, of course – but these come proportionately cheaper, with that taken into account).